It also stabilises side to side motion in similar tracking situations by counter-pivoting around its centre axis. The Serene also allows for full use of the Easyrig spring extension for going from high to low mode. The Serene supports rigs weighing between 6-19.5 kg, and the spring tension can be fine-tuned without the use of tools. It works well with gimbal rigs like the Defy G12, DJI Ronin, Freefly MoVI and Letus Helix. 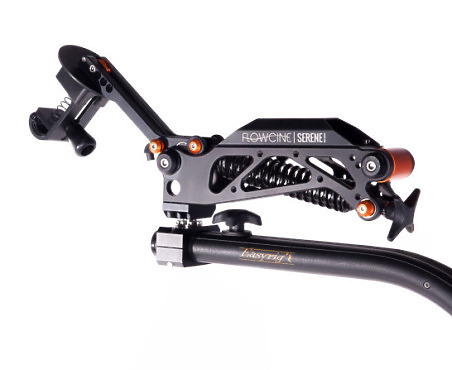 Hire the Easyrig Vario 5 with Flowcine Serene from Procam. Best service and rental rates for the Easyrig Vario 5 with Flowcine Serene and all cameras, lenses, sound, lighting and grip.